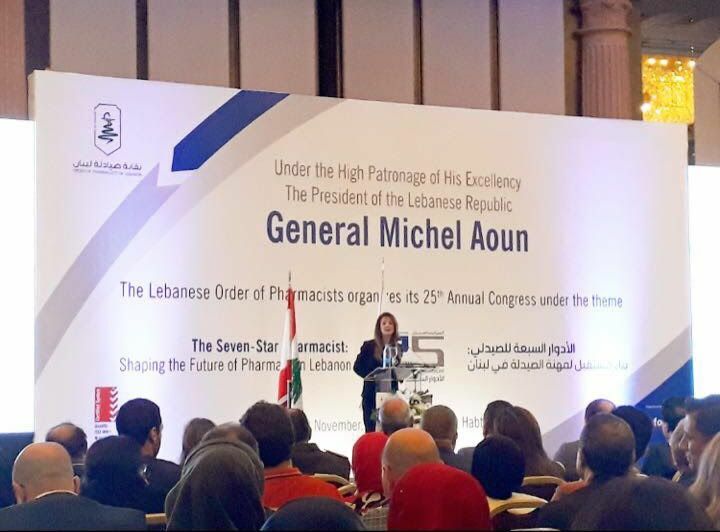 The Syndicate of Pharmaceutical Industries (SPIL) participated in the 25th Annual Congress organized by the Order of Pharmacists in Lebanon. The Congress explored the theme of “The Seven Star Pharmacist: Shaping the Future of Pharmacy in Lebanon” and was held on November 17th, 2017 at the Hilton Habtoor Hotel. The Congress was attended by H.E. Excellence Nicolas Tueini, representing H.E. President Michel Aoun, Dr. Atef Majdalani, Head of the Parliament Health Committee, and representatives of governmental institutions and political parties, as well as the deans of the Schools of Pharmacies, and a number of pharmacists. Dr. Carol Abi Karam, President of SPIL, highlighted in her speech given during the opening ceremony the seven roles of the Lebanese Pharmaceutical Industry and their roles as pillars in both health and economic systems. She shared with the audience data related to the industry’s market share in Lebanon versus the region. She also invited all stakeholders to work closely together to ensure that the legal environment guarantees the industry’s prosperity, profits resulting from the added value brought to the country, and the facilitation of job creation.